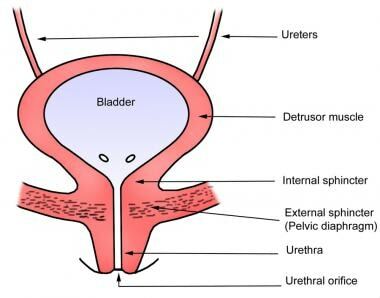 The term cystourethrography refers to a radiographic examination of the bladder and the urethra; the term cystography refers to a conventional radiographic examination of the bladder with contrast medium instilled through a urethral catheter. Cystography allows the evaluation of both anatomic defects and functional anomalies. Nevertheless, cystography is still commonly performed in the form of voiding cystourethrography (VCUG), predominantly in children,  and can serve as an adjunct to urodynamic evaluation in videourodynamics. The presence of labial adhesions is a relative contraindication for VCUG  ; VCUG is usually performed after the adhesions have been released. For an effective videourodynamic evaluation, the patient must be able to communicate and cooperate. If the patient is unable to do so (eg, if he or she is severely demented or psychotic), the risk-benefit ratio of videourodynamics must be carefully considered. Ascertain whether the patient has latex allergy or sensitivity to contrast media. Urine dipstick may be performed on the day of the examination. In spinal cord injury patients with lesions above the splanchnic sympathetic outflow tract (T5-T6), bladder filling during cystourethrography or urodynamics may trigger a life-threatening imbalance in reflexive sympathetic discharge. (See Autonomic Dysreflexia in Spinal Cord Injury .) Signs of autonomic dysreflexia include piloerection, skin pallor, sudden and severe hypertension with compensatory bradycardia, and profuse sweating and flushing above the level of the injury. Darge K. Voiding urosonography with US contrast agent for the diagnosis of vesicoureteric reflux in children: an update. Pediatr Radiol. 2010 Jun. 40(6):956-62. [Medline]. Kim C, Jeon M, Wang LV. Nonionizing photoacoustic cystography in vivo. Opt Lett. 2011 Sep 15. 36(18):3599-601. [Medline]. Shenfeld OZ, Gnessin E. Management of urogenital trauma: state of the art. Curr Opin Urol. 2011 Nov. 21(6):449-54. [Medline]. Ishak C, Kanth N. Bladder trauma: multidetector computed tomography cystography. Emerg Radiol. 2011 Aug. 18(4):321-7. [Medline]. Palmer LS. Pediatric urologic imaging. Urol Clin North Am. 2006 Aug. 33(3):409-23. [Medline]. Broghammer J and Wessells H. Acute management of bladder and urethral trauma. AUA Update Series. 2008. 27(24):222-224. Morgan DE, Nallamala LK, Kenney PJ, Mayo MS, Rue LW 3rd. CT cystography: radiographic and clinical predictors of bladder rupture. AJR Am J Roentgenol. 2000 Jan. 174(1):89-95. [Medline]. Committee on Quality Improvement, Subcommittee on Urinary Tract Infection. Practice parameter: the diagnosis, treatment, and evaluation of the initial urinary tract infection in febrile infants and young children. American Academy of Pediatrics. Committee on Quality Improvement. Subcommittee on Urinary Tract Infection. Pediatrics. 1999 Apr. 103(4 Pt 1):843-52. [Medline]. Bauer R, Kogan BA. New developments in the diagnosis and management of pediatric UTIs. Urol Clin North Am. 2008 Feb. 35(1):47-58; vi. [Medline]. Dalirani R, Mahyar A, Sharifian M, Mohkam M, Esfandiar N, Ghehsareh Ardestani A. The value of direct radionuclide cystography in the detection of vesicoureteral reflux in children with normal voiding cystourethrography. Pediatr Nephrol. 2014 Dec. 29(12):2341-5. [Medline]. Scarpero HM, Koski M, Kaufman MR, Dmochowski RR. Urodynamics best practices. AUA Update Series. 2009. 28(9):74-83. Blickman JG, Boetes C. Genitourinary Tract. Blikman JG, Parker BR, Barnes PD, eds. Pediatric radiology: the requisites. 3rd ed. Philadelphia: Mosby; 2009. 121-156. Wolf JS Jr, Bennett CJ, Dmochowski RR, Hollenbeck BK, Pearle MS, Schaeffer AJ. Best practice policy statement on urologic surgery antimicrobial prophylaxis. J Urol. 2008 Apr. 179(4):1379-90. [Medline]. [Full Text]. Goodman TR, Kilborn T, Pearce R. Warm or cold contrast medium in the micturating cystourethrogram (MCUG): which is best?. Clin Radiol. 2003 Jul. 58(7):551-4. [Medline]. Herd DW. Anxiety in children undergoing VCUG: sedation or no sedation?. Adv Urol. 2008. 498614. [Medline]. [Full Text]. Agrawalla S, Pearce R, Goodman TR. How to perform the perfect voiding cystourethrogram. Pediatr Radiol. 2004 Feb. 34(2):114-9. [Medline]. Barbaric ZL. Principles of Genitourinary Radiology. 2nd ed. New York: Thieme Medical; 1994. Kuan JK, Porter J, Wessells H. Imaging for genitourinary trauma. AUA Update Series. 2006. 25(4):26-27. Fernbach SK, Feinstein KA, Schmidt MB. Pediatric voiding cystourethrography: a pictorial guide. Radiographics. 2000 Jan-Feb. 20(1):155-68; discussion 168-71. [Medline]. Joaquim AI, de Godoy MF, Burdmann EA. Cyclic Direct Radionuclide Cystography in the Diagnosis and Characterization of Vesicoureteral Reflux in Children and Adults. Clin Nucl Med. 2015 Aug. 40 (8):627-31. [Medline]. Zerin JM, Shulkin BL. Postprocedural symptoms in children who undergo imaging studies of the urinary tract: is it the contrast material or the catheter?. Radiology. 1992 Mar. 182(3):727-30. [Medline]. Weese DL, Greenberg HM, Zimmern PE. Contrast media reactions during voiding cystourethrography or retrograde pyelography. Urology. 1993 Jan. 41(1):81-4. [Medline]. Ureterocele. Early anteroposterior voiding cystourethrography (VCUG) demonstrates small ureterocele (left). Ureterocele had been seen at prior ultrasonography of bladder. On VCUG obtained after bladder filling (right), ureterocele is obscured by contrast material. Image courtesy of Fernbach SK, Feinstein KA, Schmidt MB. Pediatric voiding cystourethrography: a pictorial guide. Radiographics. 2000;20:155-16. Oblique voiding cystourethrogram obtained at left ureterovesical junction demonstrates primary vesicoureteral reflux (ie, reflux without underlying abnormality such as bladder diverticulum, neurogenic bladder, or bladder outlet obstruction). Image courtesy of Fernbach SK, Feinstein KA, Schmidt MB. Pediatric voiding cystourethrography: a pictorial guide. Radiographics. 2000;20:155-16. Posterior urethral valves. Oblique voiding cystourethrogram shows filling defect in the urethra with marked change in urethral caliber at level of defect, which indicates obstruction. Although catheter has remained in place during voiding, secondary changes crucial to diagnosis—trabeculated bladder, abnormally prominent bladder neck, and dilated and elongated posterior urethra—are clearly depicted. Image courtesy of Fernbach SK, Feinstein KA, Schmidt MB. Pediatric voiding cystourethrography: a pictorial guide. Radiographics. 2000;20:155-16. Voiding cystourethrogram (VCUG) in patient with bulbar urethral stricture. Graphics are superimposed on VCUG to show locations of prostate and external sphincter muscle (posterior urethra). Image courtesy of Joel Gelman, MD. Voiding cystourethrogram in patient with detrusor sphincter dyssynergia shows trabeculated bladder wall and lack of cone-shaped bladder neck during voiding. Postvoiding film shows no residual contrast material. Image courtesy of Radswiki.net.